I have this thing about my kids trusting me. I don't play pranks on them, I don't lie to them, I don't sneak a bite of their food if they leave the kitchen during a snack time. I just want them to trust me...to always know that our relationship is solid. And in return, I expect to be able to trust them. However, they play pranks on me, they occasionally lie to me, and if I walk away from a piece of cake, I can probably kiss it goodbye. But, it's because they're KIDS! They're still working on things, figuring out life and trudging along toward their futures. There are 5 of them, so a LOT of trudging goes on at our house! This morning I was chatting with God while I scrubbed a toilet (sometimes entering His throne room is a bit more literal than others) and I was telling Him how I just want our family to be in the center of His will and that I want to be able to trust Him. I want to be able to trust without asking for a wet fleece, dry fleece, purple fleece, chocolate covered fleece (still considering that one), etc. We all want to sit back and shake our heads at the story of Gideon (Judges 6-8), thinking how ashamed Gideon should be to ask the God of the Universe, (who just sent a real live angel, by the way) to prove Himself to Gideon. But did you notice, God didn't strike him with lightning or curse him with plagues, or change His mind and use someone else as leader of the army. 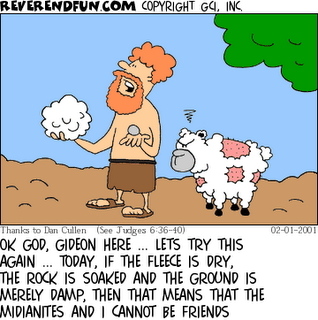 God simply honored Gideon's requests and easily soaked one fleece and then dried another. Gideon could have continued asking God for signs, waiting and watching and wondering while his own people starved and suffered under Midianite rule, but he knew he had a choice to make. And he chose to trust completely. I wonder why it is that I sometimes don't trust Him completely. Has he ever played a prank on me, lied to me, stolen from me when I least expected it? No! Yet, here I stand, in the midst of trials and struggles and way too many decisions and somehow I'm afraid to let it go, afraid He can't do a better job than I can, with this life He's given me. My favorite verse of scripture, that applies to EVERYTHING in my life (and yours too), is 1 Peter 5:7 "Casting all your cares on Him, for He cares for you". So I look at my choices, I look at my God and I think, can You trust me? Can You trust me to blindly obey, the first time You ask something of me? Can You trust me not to try to manipulate Your will until it matches up with the things that I like best, and that make me the happiest? He's so very aware of who we are, of the decisions that lay before us, of the choices we will make, even that ones that break His heart. Yet, he continues to hold my hand while He's thinking, "Yes, she disobeys and gets confused and tries to hide from me and thinks too much and hangs onto too many things, but...she's my kid! She's still working on things, figuring out life and trudging along toward her future...and when she just trusts me, she's gonna LOVE seeing what I can see now. Hi Danielle! Great Blog! So blessed I read your post. The Lord inspired me through you today. Got so much out of this! Thank you Danielle!